1 bed apartment , private pool, set in extensive grounds, 1km from village . Beautiful 1 bed apartment with private pool, recently totally re-furnished in contemporary style. Whilst the apartment is part of a larger 3 bed villa the owners guarantee that no bookings will be taken for the villa whilst the apartment is booked ensuring that apartment guests have exclusive use of the extensive grounds and private pool. The apartment is set in huge landscaped gardens of 7500 sq m (larger than a football pitch) and an additional grassed area perfect for ball games. The apartment which was totally refurnished and redecorated in contemporary style in 2017/18, is accessed at ground level and briefly comprises 1 bedroom with double bed, wardrobe and open storage unit. The modern bright white en suite bathroom has a corner shower, wc, bidet and washbasin. The open plan dining, lounge and kitchen area has 3 seater sofa, two easy chairs, coffee table, dining table with 4 chairs and comes with free wifi. The white kitchen is bright and modern with ,gas hob, microwave, fridge and ample cupboard and worktop space. An automatic washing machine is located in the garage on the ground floor. The main door leads directly out onto the huge outside patio complete with barbecue, outside dining furniture and views over open countryside. Just round the corner there is the beautiful 8m x 4m private pool with alarm system surrounded by large patio areas. Sunbeds are provided and all are set in super landscaped gardens which include a small copse, and part of a disused railway line. Towards the rear of the property is a large grassed area ideal for ball games. The garden is stocked with dozens of trees and shrubs including a lavender bed and herb garden. There is ample parking for up to 6 cars or pop the car into the integral garage to keep it out of the direct sun. The apartment is just a 10 min stroll into the working village of Cancon which has all the amenities you would require - small supermarket, boulangerie, butchers, patisserie, pharmacie, bank, bars, restaurants and pizza takeaway. Every Monday in the village square is the Monday market where you can stock up with fresh local fruit and veg and meat. The apartment is a 15 min drive away from the beautiful town of Villeneuve sur Lot with its quaint streets and lively atmosphere. It's here where you'll find major stores and larger supermarkets. The apartment is just a 30 min drive from Bergerac airport with its low cost direct flights from a number of British airports. Other travel options are Toulouse and Bordeaux airports, a 2 hr drive away. Additionally we offer totally flexible changeover days meaning guests can arrive and leave on any day of the week giving total flexibility for flights. Whilst there are many gites and houses for rent in France, this particular property stood out as it is a more modern, contemporary villa rather than the more 'traditional' stone built houses and barns. We prefer the lighter more airy, brighter feeling. The house and apartment has been totally refurnished and re decorated in late 2017 early 2018 so is fresh and appealing. The property sits in 7500 sq m of landscaped gardens which include a small copse of woods, a large grassed area great for ball games and even part of a disused railway line. It has a beautiful private pool and lovely patio areas. Just 30 mins from Bergerac airport with its cheap flights from a number of UK airports. Additionally we offer totally flexible changeover days meaning guests can arrive and leave on any day of the week giving total flexibility for flights. Short walk into Cancon village with all amenities and just 15 min drive from the picturesque Villeneuve sur Lot. Oil fired central heating is installed in the apartment. All bed linen provided and changed weekly . Brand new automatic washing machine is provided in the garage on the ground floor. Ample parking for up to 6 cars or bring the car into the integral garage. Parking available for one car in the integral garage. Bathroom towels are provided and changed weekly. Please provide your own pool towels. Open plan/ dining / kitchen. Living room has 3 seater sofa, two easy chairs, coffee table, storage unit. Bright white kitchen with gas hob, microwave, kettle and fridge. Ample wall and floor cuoboards. Modern, contemporary white dining table and 4 chairs. 7500 sq m of landscaped gardens (larger than Wembley) include fruit trees, conifers, shrubs, lavender bed, herb garden, small copse of wood, part of a disused railway line and a huge grassed area. Kayaking and canoeing available in Villeneuve sur Lot. Huge patio just outside the apartment is ideal for alfresco dining, additional patios can be found around the pool. Dining table and 6 chairs. Nearest golf course is just 10 mins away - Villeneuve sur Lot Golf and Country Club. 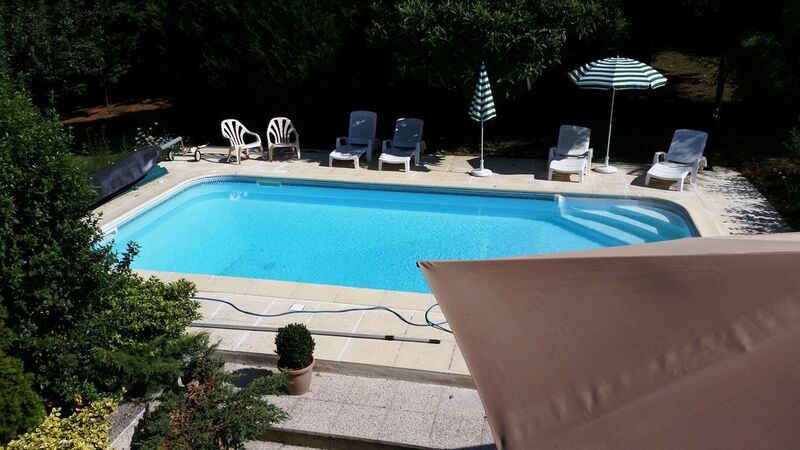 Stunning 8m x 4m private pool for the exclusive use of apartment guests, Safety / security alarm is fitted as is the requirement under French law. Strictly no smoking. No pets. Cots and high chairs available upon request. On arrival guests will find a welcome bottle of local wine. The property is situated in the heart of the "Bastide" towns of southwest France which are a growing tourist attraction, comprising one of the largest collections of well-preserved mediaeval townscapes to be found anywhere in Europe. The 'centre' of the bastide area is the Monflanquin - Monpazier - Villereal area, all within easy reach, - plus others including Eymet, Villeneuve-sur-Lot, Tournon d'Agenais, Beaumont, Castillones and Domme. Both Monflanquin and Villereal have been voted ‘One of the Most Beautiful Towns in France’ and both are less than 18 km away from the villa. Both are beautiful relaxed bastide towns full of real shops rather than tourist ones, a classic square, restaurants under the arches and a tranquil atmosphere. In the summer many of these towns also have ‘night markets’. These are usually lots of fun and a cheap way to eat well. Each square will be packed with picnic tables surrounded by market stalls selling everything you need for a meal. You simply find a table, buy a bottle of wine then choose a starter. Afterwards there will be a range of hot meals, perhaps duck sausage with chips, maybe roast lamb with curried vegetables and for dessert there is usually a crepe van as well as fruit or homemade cakes. These night markets are very popular.